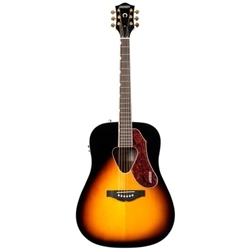 With its distinctive triangular soundhole and stylish pickguard, the Gretsch G5024E Rancher dreadnought acoustic-electric guitar will transport you back in time. The Rancher series from Gretsch, originally introduced in the early '50s, stood apart from the standard models of the day, due to its unique design. The G5024E's solid spruce top, which is reinforced with scalloped X-bracing, delivers an unbelievably rich, resonant sound that will add an air of significance to everything you play. You'll even be ready for exceptional plugged-in performance thanks to the built-in Fishman Isys+ preamp system and Sonicore under-saddle pickup. Whether played acoustically or amplified, the Gretsch G5024E Rancher dreadnought is ready to take you back in time! You get Gretsch's extra attention to detail with the G5024E Rancher dreadnought. The solid spruce top is a premium feature not normally found on guitars at this price, creating a lively sound that will become even more harmonically rich as it ages. The spruce top is reinforced with scalloped X-bracing, a premium touch that enhances the projection and tonal balance while minimizing vibration dampening. And the rosewood bridge features compensated saddles, for optimum intonation and tuning performance. With extra care like this, you can tell that the G5024E Rancher dreadnought was made to be played for a lifetime.